This volume celebrates the life and work of the anthro­pologist Ivo Strecker, who has studied with the Hamar of southern Ethiopia since 1969. Through this decades long engagement, as well as his ethnographic films and his work in spearheading the international Rhetorical Culture Project, Ivo has been highly influential, both in advancing anthropological theory and encouraging nu­merous students to commit to fieldwork in and around Hamar. 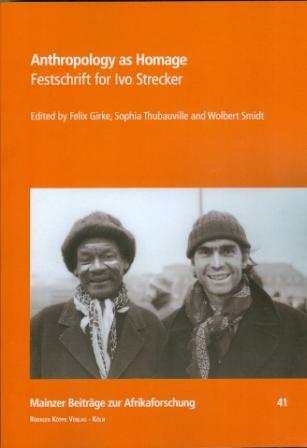 While alluding to various facets of Ivo’s syn­thetic thinking and his unique personality, the contri­butions to this Festschrift also make important state­ments on fieldwork, visual anthropology, rhetoric, and other fields that relate to his œuvre. Felix Girke is a social/cultural anthropologist who has been researching southern Ethiopia since 2003 and Myanmar since 2012. Sophia Thubauville is a social/cultural anthropologist at the Frobenius Institute in Frankfurt/Main. She has worked in southern Ethiopia since 2002. Wolbert Smidt is a historical anthropologist at the Research Centre Gotha and Associate Professor in Eth­no­history at Mekelle University, Ethiopia.